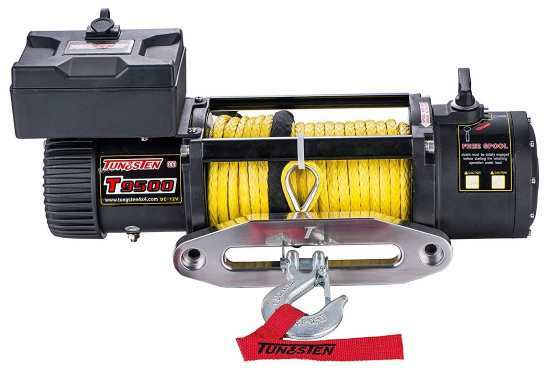 Tungsten4x4 T9500s Winch Review Is It Worth to Buy? Tungsten4x4 T9500s Review: Is It Worth Choosing? Would you like to get the winch that is able to provide you with the smooth operation? Then, don’t look any further! Its name is Tungsten T9500s presented by the reputable American Producer. First, it may seem that it is similar to the most number of winches but it is not so. Perhaps, it doesn’t differ much outside but inside you will definitely find great advantages of this model! Want to know what they are? Hold on reading Tungsten T9500s review! The new model of the popular brand differs with its original parts of the body, where bimetallic drum bearings and full oil seals providing IPX67 protection level have been used. The pulling power of the winch is 9500 lb or 4310 kg. There is nothing to worry about if you get stuck unexpectedly. The pulling power is sufficient to help you in getting out of any trouble. The model features 85 feet of 3/8 inch wire rope. Among the standard characteristics, there is a 3-stage planetary gear system. You will be glad to discover that the model is equipped with the seals that are water resistant as well as with the line recovery, which distinctive features is its speed. What Advantages Does Tungsten Winch Have? Let’s have a look at the features, which make this winch one of the best choices for off-road lovers and not only. First of all, we would like to draw your attention to the 5.5 HP series motor, which is able to guarantee the 100% smooth work. The obvious advantage of this model is its design, which allows to keep dust and water out. You won’t face any difficulties when installing the winch while during the process of use. There are all conveniences for the winch control. In the box, you will find the 10 feet wireless remote control, which will make the process of winch use both safe and convenient. The producer offers the 3-year warranty with the product. Is Tungsten Exactly What You Need? Are you an owner of a jeep or 4×4 truck? Then, don’t hesitate to get this winch model as it will suit you perfectly as well as those who own modified vehicles. For example, it can be used not only for cars but also for boats and multifunctional utility trailers, tractors, forestry, etc. As you can see the winch can serve for various purposes. It will help to do any kind of different works and every time it will provide you with efficient performance. You can use it even in the industry but keep in mind that its power will be sufficient for the light applications only in this sphere of use. I have got Tungsten for my Jeep and have already checked how it works. I can say that it hasn’t disappointed me! Last Sunday I got stuck in the mud and it helped me to get out successfully. I like how it looks like and how it does its work! I would rate it 5 out 5! I have not used the winch yet. That’s why I can express only my impression from the installation process, which was really easy. The instructions are very helpful and the whole process doesn’t take much time if you have at least some experience of using winches. Hope that the work with Tungsten will also meet my expectations. Pickwinch.com is a website that is not owned or operated by Warn Industries, Inc. Copyright © 2019 Warn Winches.